when we were in Roatan and have tried to find the ingredients here to make them authentically….we did bring some beans back with us but have almost used them all so we will be searching for a red refried bean recipe that will have the same wonderful flavors. “…….Ok I’ll see if I can get Angela to take me down there this week….great excuse to go get a baleada too….but it is downtown Coxen Hole on a dirt side road….a real hole in the wall….we only found it because we know a local….lucky us!! Also the beans here are to die for…they are red and come in a plastic package….name brand Natura’s….even Gannon now eats beans…..Sean’s trying to research where to get them….sounds like they are going to have all the ones they too brought back gone before I get home….I will bring more!!!! A baleada is Honudura’s version of a breakfast burrito – kind of. 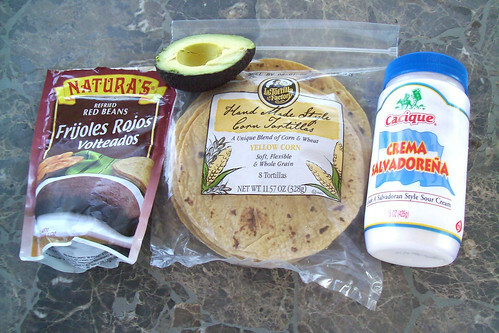 Key to remember is different ingredients make different tasting baleadas. Since some of the local ingredients are not readily available in the US (or at least not in the traditional Honduran version) you have to make do with what you have, substitutes noted. Scramble the eggs and melt cheese on top. 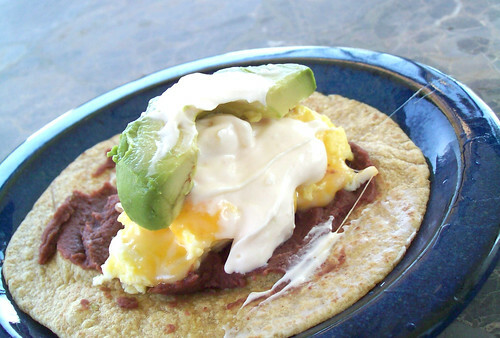 Spread warm refried beans on tortilla and then add eggs, Crema, and avocado. spread other ingredients fold in half. Let me just say, I absolutely love your site. I am now following it VERY CLOSELY..LOL. Amazing food and posts, as always. Oh – you’re too kind! Glad you enjoy our bantering and thanks for letting us know! You’re making my mouth water. Can’t wait to get back to Roatan for our breakfast treat! Keep me posted if you find those red beans. I’ve looked for them here also, to no avail. They must be a Honduran exclusive! I wouldn’t be imaginative enough to come up with such a great recipe! Great photos, Wanda! Can’t wait to get back to Roatan and try these. I’m thinking winter of 2010 will see my return. Winter in MN without it is too long. That’s an interesting recipe and suggestion for breakfast. I like saying it…”Baleada” – fun! Yum! Looks so good!I really love your posts! Wow! I love your site! beautiful pictures and great recipes. These look so great! I’ve never had red refried beans before. Will definitely keep my eye out for them! Wow! Brought back memories of Tegucigalpa. I am lucky to live in Houston where there is a large Salvadoreno population. Thanks for the post. Looks yummy. I love anything with avocado. That looks and sounds truly delicious!! oh my that looks tasty! I love all flavors and all cuisines from different cultures. This looks really so delicious! The photos are stunning. Thank you Emma and Wanda. Such a delicious and filling way to start the day.Definately gotta try these next time. The crema is unlike that we have in North America. You will hear it referred to as mantequlla blanca (white butter) or mantequilla crema. Thanks for the info Jenn we will give it a try…. Was just Googling Honduran mantequilla (looking for it here in MN) and came across this blog! 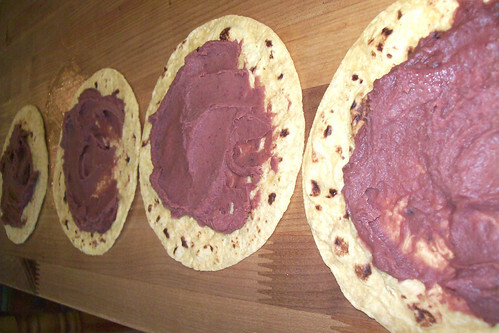 It’s been a year and a half since I got back from my foreign exchange to Honduras and I crave baleadas every day– they aren’t just a breakfast food! You can eat them for lunch or dinner, and handmade flour tortillas and refried beans are better than anything you could get in a package. this brand sell both the cheese and the crema! Wonderful – thank you for passing along this info. !